Does anyone understand the bit about the ‘egg holders’ in the orange strap, or is our dodgy translation just wide of the mark again? yep huevos is spanish slang for balls so this model does not need egg holders is not so subtly saying he has no balls. @Syndex: Ah, it all makes sense now! Thanks chieftan. Also, the “no se enchufa” is Argentinian slang. Directly translated it means it doesn’t plug in but it means you don’t get into the game. 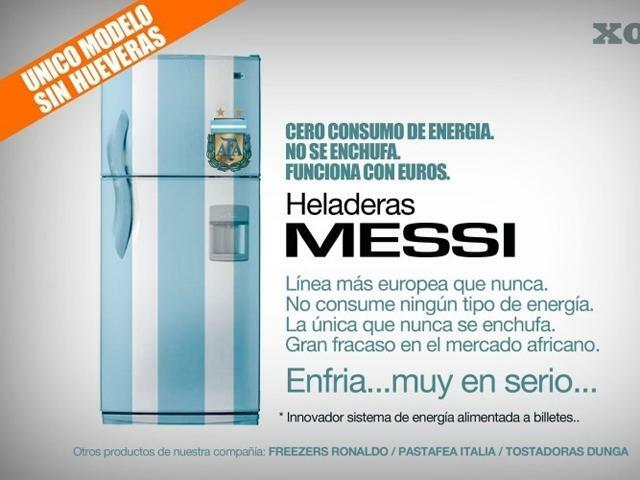 Wow… They also go after Cristiano Ronaldo, Dunga, and Italy… Cheeky, cheeky ad, I love it! Too bad it’s not in any language I understand. English and Swahili. — This is Uruguayan fans being one-dimensional and bad winners, not Argentinians. Did you actually read the headline? messi is the best player.